Working backwards… or starting with the splash at the bottom of the waterfall, the plan looks like this. The main goal: Set up a market stall at Frome Independent market to publicise Frome Blooms. Secondary objective is to sell lots of flowers and plants. Basic ‘success’ is to cover the cost of the stall (£47)! Timing: Market day, Sun 4 June, arrive 6.30 -7am. Plan of action: Set up Frome Blooms flowers stall with a 3x4m pitch at Frome Independent market. The stall will sell flowers, vases, plants and postcards of flowers, also bouquet garni and spare seeds. 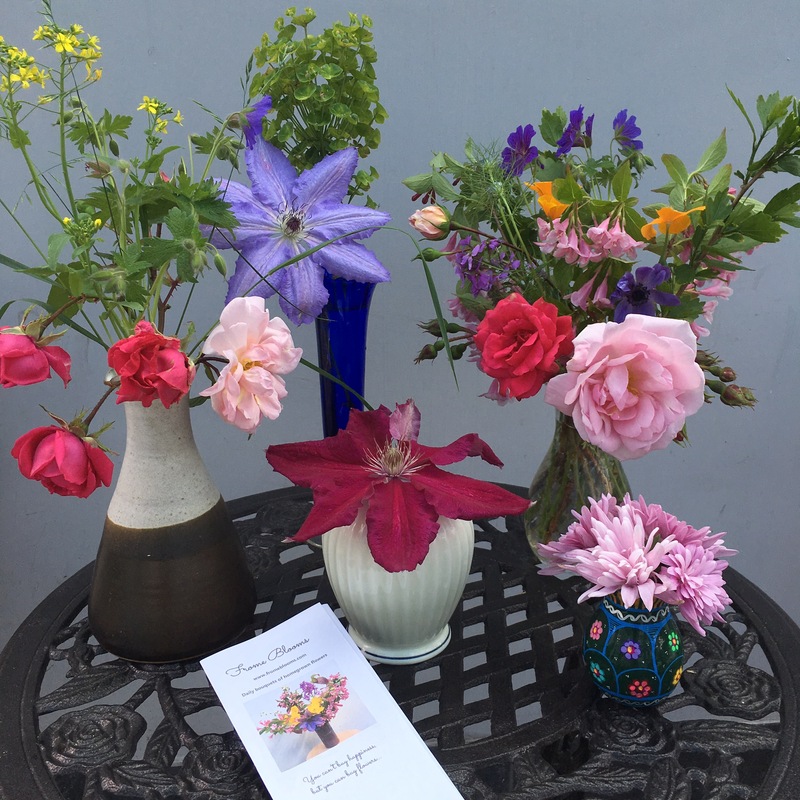 The stall will offer ‘pick-a-posy’ so people can choose their own bouquets. Floral display: Tables, buckets of flowers, vintage vases, cellophane, ribbon, tape, boxes and bags. Plants display: Salad baskets, potato bags, herb pots. Pack up salad boxes, herb pots, strawberry pots and potato bags. Check weather forecast, cross fingers. Cut the flowers (last minute), lightly trim and put in buckets in boxes. Checklist for display: Signs, tables, cards, iPad. Look at what flowers and buds are available in the garden, remove any bugs or damaged stems, and ask fate to be kind. Don’t panic. Review checklists, weather forecast, and have a little worry about how it will go on the day. Packaging preparation – Boxes to take stuff to market, decorative wrapping for bouquets, bubblewrap for vases and bags for plants. Get materials to make a big sign. Prepare ‘seeds for sale’ (put spare seeds into small envelopes, label, and box up). Print postcards and plan a display. Sort out transport for market day. Investigate taking payment on the day on ipad via paypal. Plant out new cutting flowers. It’s a plan, and it’s looking do-able, I hope! The weather is out of my control, and I can’t make anyone buy anything, so it’s possible that all this effort will end in disappointment, but you can only fail if you try, and if you try you might succeed, so I’d better crack on with it! I hope your garden plans and plants are all coming along nicely.